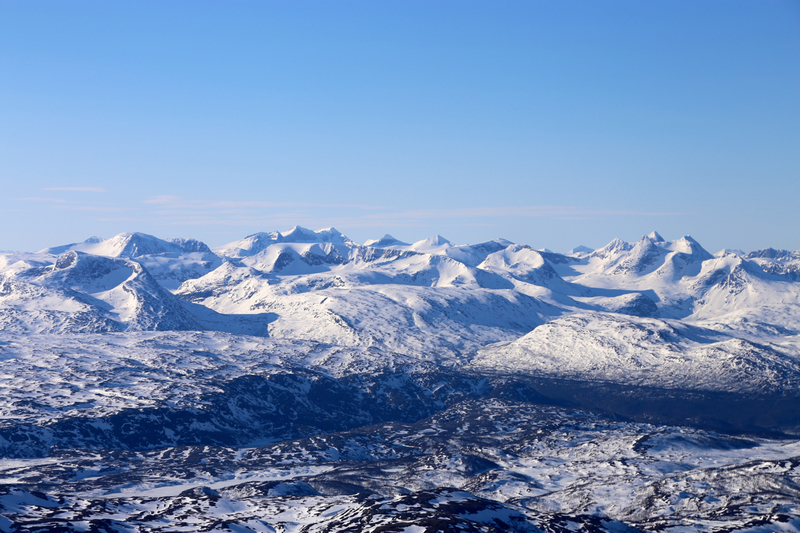 This mountain is located on the border between Norland and Troms, slightly east of Hwy. E6. 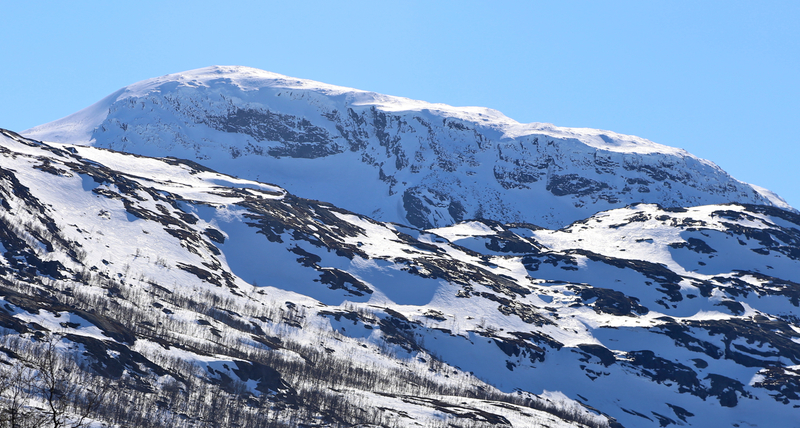 From Bjerkvik, where E10 forks off E6 (slightly north of Narvik), continue north on E6. Note the road forking left to Gratangsbotn. Only about 400 meter later (along E6), a smaller road forks right to Kvernmo. Near the end, as you arrive in Kvernmo, take the (obvious) road left that climbs a bit further (and higher). When this road makes a sharp right (serving some farm activity), park on the left hand side. This is the trailhead, location N68.63849, E017.74401, elevation about 274 meter. Ski more or less dierctly towards the peak. 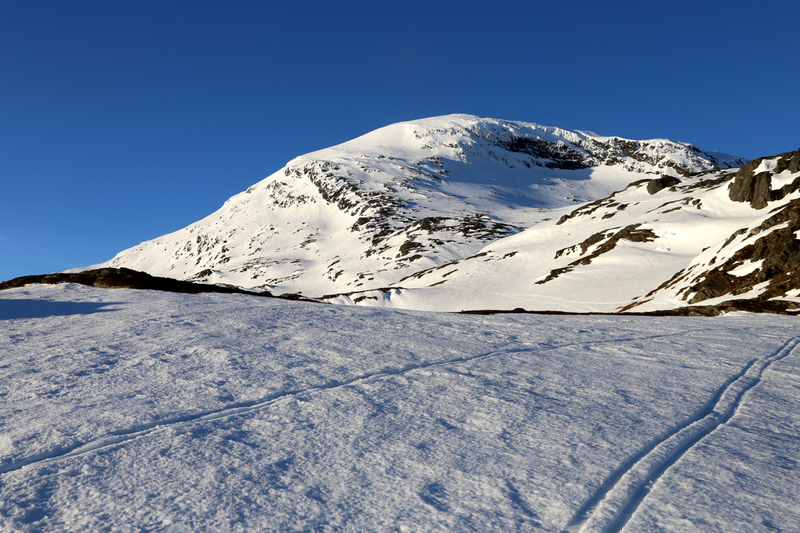 In the spring, older ski tracks are likely. The easiest route crosses Leigassletta and continues to Leigasskaret, passing right (west) of lake Britavatnet, 783m. From here, one may access the east ridge of the mountain, fairly easy all the way to the flat summit plateau. An alternative, steeper route climbs the north ridge, joining the east ridge just below the summit. This route is likely the most direct in summer. 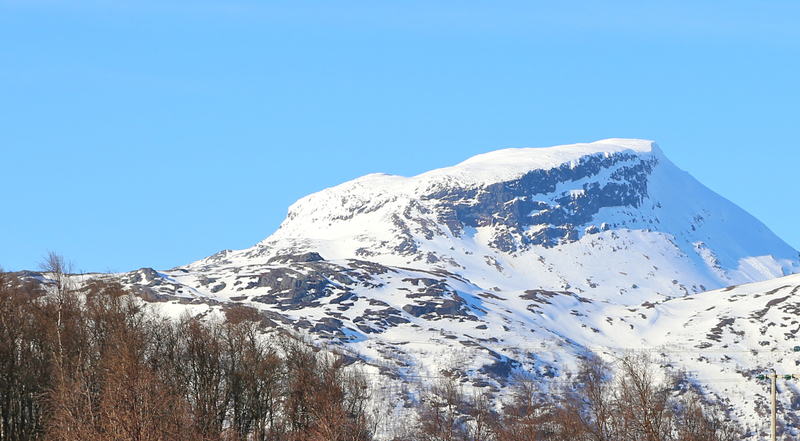 In winter, the lower part of this route may be icy and due to the general steepness of the terrain, one should climb it with crampons and having an ice axe for added safety. 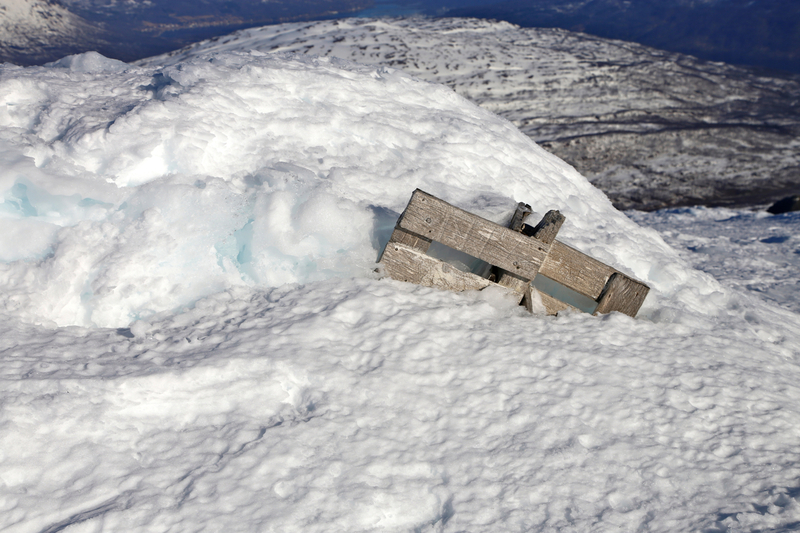 The summit is pretty flat and has several small bumps that may be buried cairns. I had a retun flight to Bergen at 1500. After looking at the map, I decided that Leigastinden might be a fine goal with an early start. Spending my second night at Skoddeberghytta, I woke up already at 4am with the sun hitting nearby peaks. I was parked at the trailhead shortly before 5am, and skied at 5. The snow was crusty and frozen, the temperature had been low last night. I had read a trip report, but that was a summer climb. 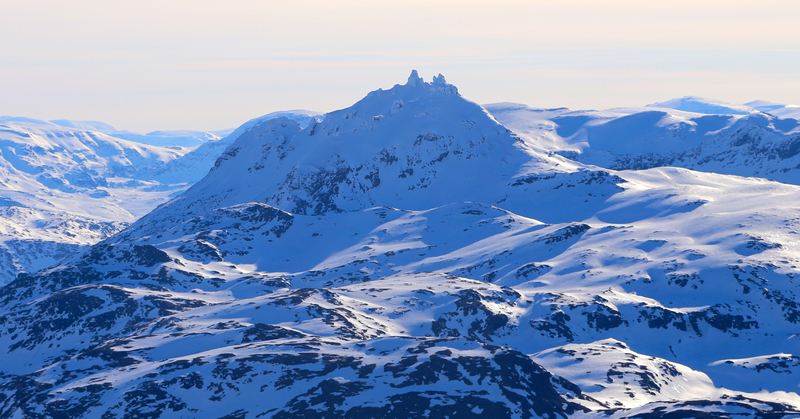 If I had studied the map, I would have noticed that the east ridge is the way to go in winter. However, I proceeded directly to the lower part of the north ridge. 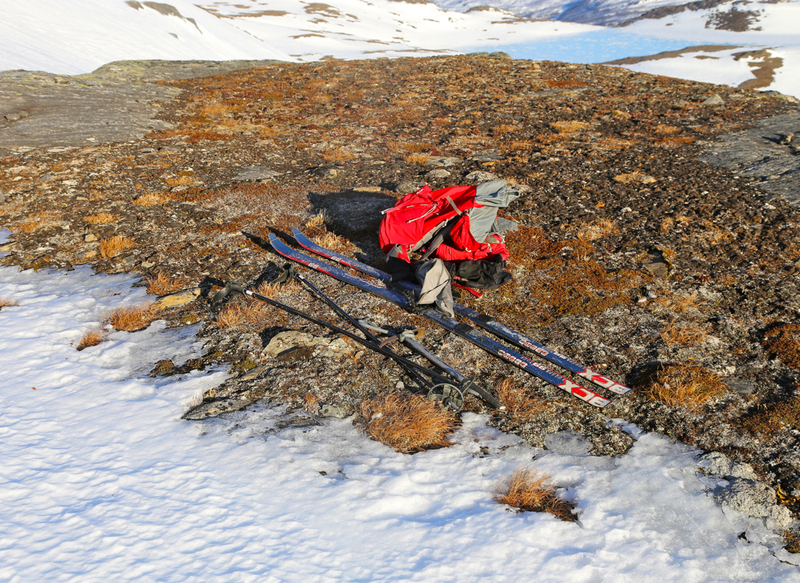 The slope got steeper and more icy, thus at 0640, I decided to leave my skis behind and continue on foot. 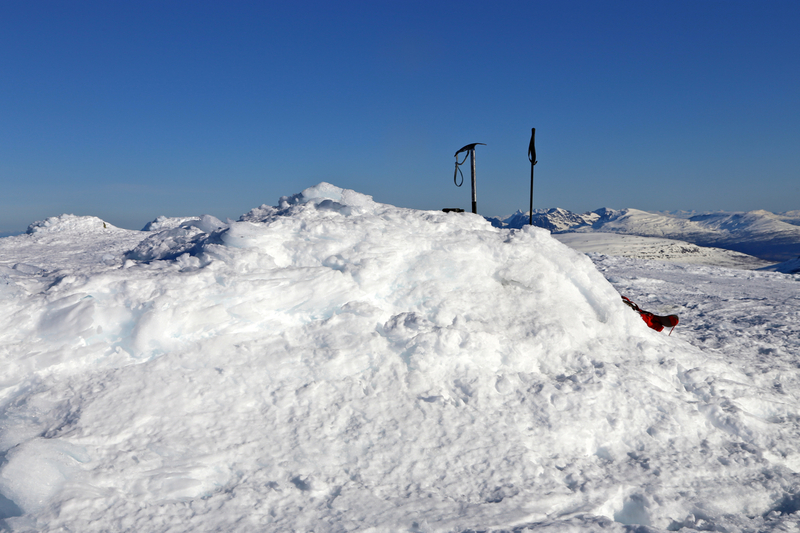 A bit more than 450 vertical meter remained, it was clear that this could only be done with crampons and an ice axe. I first gained elevation on a large, pretty nice slope. Next, a steeper traverse up some sort of ramp to my left. This was the crux of the ascent. 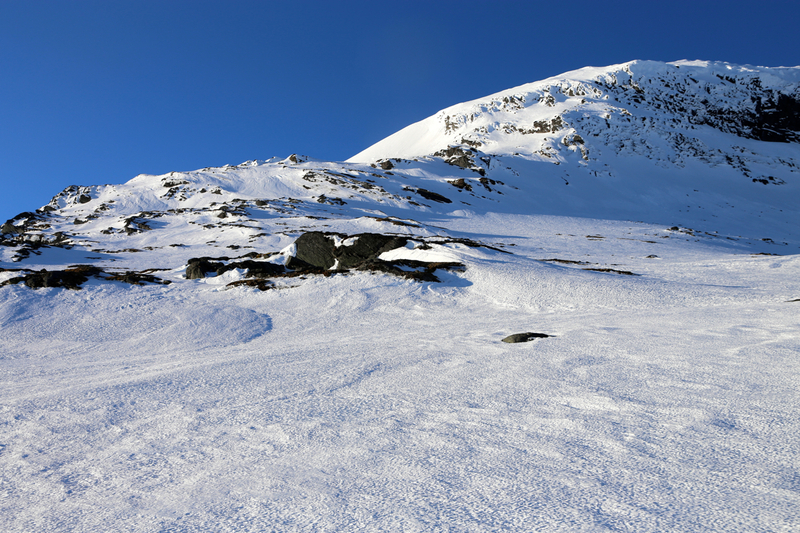 Higher up, I arrived at a small plateau with pretty straightforward access to the east ridge. 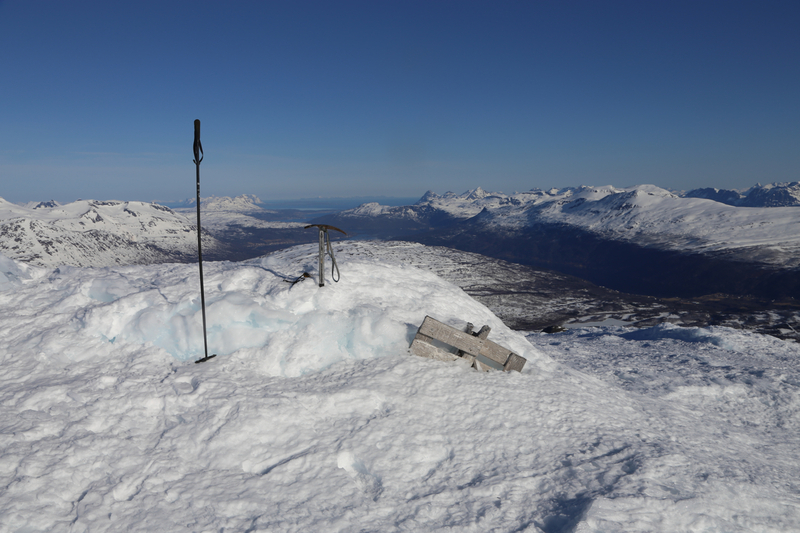 I arrived at the summit at 0740, a bit less than one hour from my skis. The weather was just fabulous, great views in all directions. The summit had two cairns, pretty close, of essentially the same height. The one further north had an old, wooden trigonometric marker. I spent 20 minutes on the top before descendinng the same way as I had ascended. The descent was pretty easy, taking it slow and carefully in the short, steeper section where I had followed some sort of ramp. I was back at my car by 0930. Just as I was reorganizing gear in preparation for my return flight, a car with a swedish couple arrived. They asked if I was planning to head out on a ski trip and were fairly astonished when I told them that I just had finished my skiing for the day. A local peak located to the east.